Well, the moment we’ve all been waiting for: The Cougs, on TV (if you have ESPNU or happen to be in a bar that does), against a quality opponent. Baylor has been impressive in its 5-0 start, and this actually looks to be a better tournament resume builder than was initially thought. The Bears are coached by Scott Drew, son of Homer and brother of Bryce, all of Valpo fame. He’s been there for five years, and Drew and the Bears are looking at this as a kind of a get-over-the-hump year. Lots of juniors who have taken their lumps and are desperate to finally put their mark on this program. The good news for the Cougs is that this is a similar team to themselves. Guard oriented, no dominant big man. The bad news, is that this is a very good 3-point shooting team. (And if you read my post below, you know why that’s a problem.) Led by dynamic guard Curtis Jerrells, the Bears have three players who have shot more than 20 3-pointers who are shooting at a better than 40 percent clip from beyond the arc. Jerrells is at 48.3 percent. That likely will be the difference in the game — shut down the Bears on the perimeter, win the game, because they don’t take care of the basketball: 155th in the country in turnover percentage. Without 3s to bail them out, that offensive efficiency will drop through the floor. If you’re looking for a hometown read on the Bears, here’s one from the Waco Tribune-Herald. Otherwise, leave your thoughts on the game below as we head to tipoff and as the game unfolds. I won’t be able to comment as it goes along, since I’ll have to find a bar. Welcome to our first real breakdown of the Cougs, something we’ll do from time to time as opportunity allows. The timing seems right to do one now, but bear with me — it’s a little long, but I think it’s worth your time to read it to the end. Six games into the most anticipated season in the history of WSU basketball — and with the two toughest games of the non-conference schedule looming, starting tonight — I can’t possibly be the only Coug fan who felt a little uneasy about the lack of wide scoring margins against the mediocre competition. I mean, aren’t top 10 teams supposed to obliterate the Montanas of the college hoops world? After three relatively close games against Boise State, Montana and Air Force, a lot of people around the country were asking themselves how good the Cougars really are. I think that’s the wrong question, given the lack of stiff competition. There’s just no way to accurately answer that question yet. The right question is this: How well are the Cougs really playing? Taylor Rochestie is a big man? I’m working on a post for later today that takes a look at where the Cougs stand heading into their two toughest non-conference matchups, but this will hopefully tide you over for a few hours. The eternal lament of Coug fans everywhere is that our teams get no respect, even when they’re good. Name another team in the top 10 that has had only one game made available on television. Or, name another top 10 team that would participate in an interconference challenge and be shipped off to a road game against a middling team. UNC got Ohio State. Duke got Wisconsin. Go about two minutes into this video with Fox Sports college basketball “expert” Kris Johnson. The piece itself is titled “Beyond the Arc: Wazzu for real?” His analysis starts with the standard “Derrick Low is real good, Kyle Weaver can do it all, blah blah blah.” Then he makes a couple of curious statements that will reinforce your belief that most of the national media has absolutely no clue what they’re talking about when it comes to our team — that they just regurgitate what they’ve read elsewhere over and over again. Taylor Rochestie — all 6-foot-1 and 186 pounds of him — is a big fella inside? Just look at that shot blocking intimidation above! The Cougs could earn a No. 2 seed as they did last year? For some reason, I thought it was a No. 3 seed. Take my advice: When listening to TV people talk about the Cougs, listen to Andy Katz. Ignore everyone else. We still don’t know a whole lot. The parity that has created so much upheaval in the BCS this year might just be the tip of it for college basketball. There simply doesn’t appear to be a real dominant team this year. It might shake out that UNC, Memphis, UCLA or Kansas get on a real roll at some point and separate themselves from the pack. But I get the sense that this is going to be a crazy year. I also get the sense that not a whole heck of a lot separates Nos. 5 through 15 and 16-25. (Or 16-40, for that matter.) There are a lot of teams that are just very similar right now, and it’s pretty much impossible to distinguish between most of them. Case in point: How many of you really believe that WSU, who I’ve got No. 5, is distinguishably better than Tennessee, who I’ve got at No. 16? The margin is so small, and I don’t think that’s going to change much as the year goes along. If anything, upsets are going to make it more difficult to figure out who’s for real, and who isn’t. That might seem like an odd thing to say to a guy who was fired yesterday for not leading the football program to heights we became accustomed to with three consecutive 10-win seasons, but it needs to be said to a guy who served Washington State University with the class and dignity that far exceeded the standards most people have for their coaches. Many have said yesterday was a great day for WSU football. It was not. It might have been necessary after going 11-23 the last four years in the Pac-10. It might have been necessary to bring some stability to the recruiting process. And it might have been necessary to prevent a UW-esque slip into oblivion. But it was anything but a great day. A great day would have included Doba wrapping up a stellar career with a celebrated retirement. A “mutual decision” to go in a different direction — and if you believe that, I’ve got a bridge I want to sell you — is not great for anyone, except maybe the guy who eventually gets the job. What I will remember about Bill Doba was his passion for football and his genuine nature. In a field that’s filled with more fakes than you can even possibly fathom — and I can tell you stories off the blog if you ever want to hear them — Dobes was the same guy down at My Office as he was with his players as he was with the media. His “aw shucks” persona really is who he is. 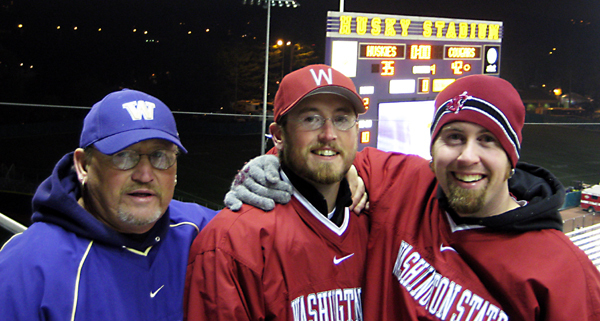 He gave WSU all he had, even as his wife battled cancer, eventually passing away — a struggle I can’t even begin to pretend I understand. I remember talking to Doba once for a freelance preview story. I had recently interviewed UW coach Keith Gilbertson, who spent the entire 20 minutes more or less telling me how stupid my questions were with curt responses and snide comments. Then I called Doba. He asked me how I was doing. He made small talk with me. He gave me everything I needed for my story, and then some. He made me feel like he had all the time in the world to chat with an old friend which, of course, I wasn’t. I didn’t even tell him I was a Coug until the very end of the story, when I told him how I happy I was for him when he got the job. There was no celebrating in these parts yesterday. Thanks, Bill, for all your work with WSU over the past 20 years. You will be missed, and I hope life with your family is everything you dream of. Feel free to share your fond memories of Doba below. If you’re with us, then you’ll be interested in noting a couple of early projections of the NCAA Tournament field. ESPN’s Joe Lunardi has the Cougs in as a No. 2 seed, heading out to Denver … for a rematch against Oral Roberts! David Mihm at Bracketography.com has the Cougs as a No. 3 seed. It’s laughably early to put any kind of serious stock in this stuff, but it’s fun nonetheless. That great weekend — combined with some losses by higher ranked teams — resulted in the Cougs vaulting to No. 6 in both the AP and the coaches polls. It’s the highest ranking ever for the team. We’ll have a new edition of the BlogPoll to unveil tomorrow, so that news will have to tide you over until then. We’ll have some analysis of the weekend that was at the round-robin event in Spokane, but if you’re looking for some first-hand thoughts, check out this comment from loyal reader Longball. In other news, it appears we probably will never know what really happened to Tony Harris. Sad. Friday vs. Montana, 7:30 p.m.
Sunday vs. Air Force, 2:30 p.m.
With the Apple Cup coming up this weekend — and yours truly will be there, celebrating, win or lose thanks to the end of a certain quarterback’s career (but that’s a topic for the football blog) — news on the Cougar hoopsters has been sparse now that the season is fully under way. With Thanksgiving on tap tomorrow, and since I’ll be traveling to the west side and unsure if I’ll be able to get to a computer, I figured I’d throw up the game(s) thread for the Cougar Hispanic College Fund Challenge going on this weekend in Spokane. The bad news is that once again, none of the games are on TV. The good news is that from here on out, virtually every game is. The Grizzlies are poised for a run at the Big Sky Conference. They are led by two preseason all-conference first-teamers, Jordan Hasquet and Andrew Strait, who has been mentioned for conference player of the year honors. Senior guard Matt Martin and sophomore point guard Cameron Rundles work the perimeter and give Montana a balanced and experienced attack along with Hasquet and Strait. … Coach Tony Bennett’s pack defense is as good as any in the country, but Montana’s inside-out attack puts the Grizzlies in the game. Some were surprised by UCLA’s near upset against Michigan State last night. I was not. You saw a perfect example of why I don’t have the Bruins ranked No. 1 in my Top 25: They just are not the same without Darren Collison. He is the juice in that engine. He directs the offense, giving it tempo and flow, and is absolutely nails on the defensive end, wreaking havoc with his multitude of steals — 2.2 a game last year. That the Bruins had the talent and guts to come back in that game says a lot about them, and it was impressive. To do that with all the young players they have against a team that returned all its players, and do it without your team MVP? That’s really saying something. And if you haven’t gotten a look at just how good Kevin Love is, he’s reason A-1 why the Cougs probably can’t win the Pac-10 title this year. UCLA will be the best team in the country … just not right now. The other big news of the night was Oregon’s upset loss to St. Mary’s. Informed minds saw that as a potential upset, what with the Ducks traveling for a true road game at the WCC school. It’s easy to chalk up the loss to an unbelievable performance by true freshman Patty (yes, that’s his real first name) Mills, who dropped 37 on the unsuspecting Ducks. But their problems were bigger than that last night. The No. 12 team in the country never even had the lead against the Gaels after the midway point of the first half. They gave up 61 points in the second half, and sent St. Mary’s to the line 36 times. Some of that was probably due to late fouling, but you get the picture. In my Top 25 comments, I singled out Tajuan Porter as the key for the Ducks, and that I wasn’t sold on him as a floor leader in the absence of Aaron Brooks. Well, he scored just 13 points last night with one assist and two turnovers. He also shot nine 3s, making only three. Porter might be 5-foot-6, but he’s no point guard, and Ernie Kent’s insistence on fitting a square peg into a round hole because he has no other true point guard on the roster will be a constant problem for the Ducks this year. On nights when the offense isn’t scoring 90 points, Oregon is going to struggle. Both national polls came out yesterday, and the Cougs are holding steady at No. 9 in each. But those aren’t the polls you should care about. What you really should be paying attention to is the BlogPoll Top 25, voted on weekly by 15 different bloggers from around the country, including yours truly! Some blog on specific teams, others on college hoops in general. You’ll now find each week’s BlogPoll on the right-hand side of the page where the AP Top 25 used to be. (I figure you can find the AP poll lots of places, but something as special as the BlogPoll? Well, you’ve gotta go to the best blogs to get it.) I’ll also post my ballot here each week for your perusal and debate. One thing to note with my poll votes: I don’t vote like your typical AP or coach voter. They do what I call slotting — win you move up, lose you move down, regardless of how you looked or how you’re actually playing. I rank teams based off of who I think is the better team at that time. A prime example right now is UCLA or Stanford — teams missing key players who probably would be ranked higher, but are ranked lower by me because those missing players make the team worse. Ultimately, a team should be able to beat every team below it that week. Is it fair? I think so. I think it’s more fair than keeping a team in a slot it doesn’t deserve simply because it hasn’t lost.